On Thursday last I led a walking tour of the medieval walled town of Fethard in Co Tipperary for the Fethard Historical Society as part of Heritage Week. The medieval town walls surrounding Fethard town( image Tipperary Tourism). 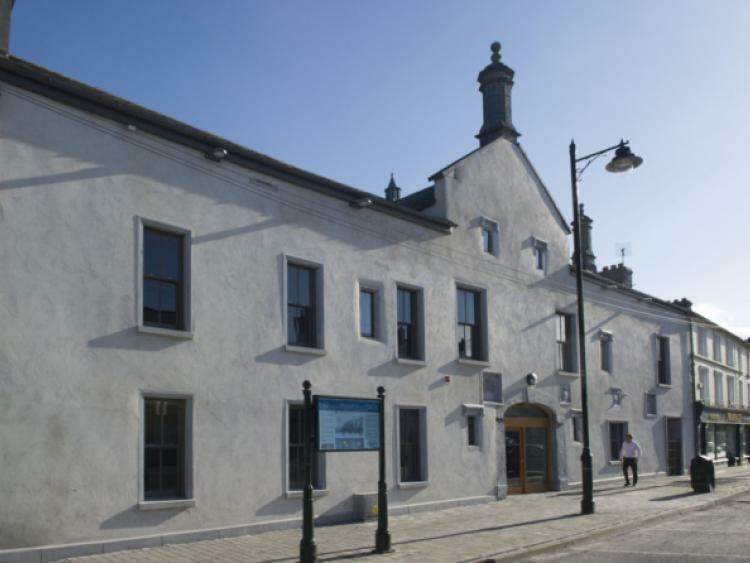 The tour began at the newly restored Tholsel Building which now houses the Fethard Horse County Exhibition.The Tholsel was first built as an almshouse by the Everard family circa 1610 and it subsequently housed the Fethard Corporation until it was abolished in 1840. The building itself is very impressive but there are three very interesting plaques incorporated into the facade of the building, facing out over the main street in the town. There is a lovely crucifixion plaque with a very hipster Christ figure nailed to the cross. The figure of Christ has long hair, a beard and moustache.The cross stands on a skull and cross-bones. The symbol of the skull and cross-bones is known as memento mori. It was used as a visual tool or a reminder to the passer-by of his/her own mortality. Dame Amy Everard, formerly Roche, relict of John Everard the younger, took care to affix these insignia on 10th May 1646, which the Everard founders and patrons of this building wished to do and were unable, being overtaken by death. Beside the crucifixion plaque are two heraldic plaques. The use of heraldic emblems first began in the twelfth century when they were used on banners and shields of knights as a way to identifying knights on the battle field. They quickly became symbols of family name and lineage and were by aristocratic families. The plaque above represents the two arms-bearing families of the Roches and the Everards. The families were united through marriage and the union is be represented heraldically on the shield of arms of the plaque. The husband’s symbols are on the viewer’s left, and the wife’s on the viewer’s right. In heraldic language the viewer’s left is the right, or dexter, side of the person bearing the arms, and the viewer’s right is the bearer’s left, or sinister. The shield is divided per pale/ vertically. On the dexter side we see the Ermine field. Ermine is a black pattern based on the white winter fur with black tip at the tail of stoats. The fur was much sought after in medieval times and it was used for the linings of medieval coronation cloaks and some other garments of high-ranking peers and royalty. Above the ermine pattern are two silver mullets or stars the symbols of the Everard family. The sinister side depicts three fish swimming horizontally, the technical term for which is fish niant depicts the symbols of the Roche family. Over the shield is a helmut known as a helm this was very common motif in the sixteenth century heraldry. Sitting on top of the helm is a pelican wounding its breast with its beak to feed its young with its own blood. The pelican, is one of the few female beasts used in heraldry. In medieval mythology the female pelican wounded herself to feed her chicks. This symbol of sacrifice carries a particular religious meaning and is symbolic of Christ’s sacrifice on the cross. Over the pelican is a wreath or mantel. Below the crest is the ‘Everard motto Virtue consists in action’. Under this again are the initial JE and AR for John Everard and Amy Roche. The second heraldic plaque depicts the symbols of the Butlers of Dunboyne. The plaque has a central crest, divided into quarters. The 1st and 4th quarter show three scallop shells over a chief indented. The second quarter had three covered cups refer to the office of the Butlers as the Chief Butler of Ireland. A title held from the late 1100’s when it was first given to Theobald Walter. Many branches of the Butler family used the covered cup in their coat of arms. The third quarter has a fess, this is a thick band which represents le Petit of Meath. If coloured the fess would have been black on a silver background. Over the shield is the helmut with ostrich feathers. On either side of the shield are what is known as supporters- a lion standing and a horse standing on their back legs. Under this is the motto The Fear of the Lord is the Fountain of Life. The name James Donboyne is under the coat of arms but looks like a later addition. From the Tholsel we headed to Chapel Lane via Madame Bridge. Here we spent time looking at a nineteenth century plaque in the wall of a cottage. This plaque has been discussed on the Irish Folk Art Blog. The tour ended at the Augustinian Abbey founded c. 1306. The friars lived here until the time of dissolution of the monasteries in 1540. The abbey then passed into the hand of Edmund Butler the Baron of Dunboyne. In nineteenth century the Augustinians established a presence here again and the current building was rebuilt in the 1820’s. The abbey is a very interesting place and deserves a much more detailed post. The abbey has a very fine collection of fifteenth century masons marks. The current building is multi period building. It is in the section dating to the fifteenth century that the masons marks occur. They are found on the very fine arches leading into the modern Lady Chapel. During the fifteenth century the Lady chapelthe chapel of the Butlers of Dunboyne. Masons’ Marks were used by stonemasons for hundreds of years to identify their work in order to demonstrate their skill and to receive payment. They seem to have begun in Ireland following the Norman invasion and the adoption of the Gothic style of architectural in the mid to late thirteenth century. Each mason had his own registered mark which he scratched or chiseled on to the stones he carved. By looking and studying masons marks on different buildings it can be possible to identify the same mason and see the different places he worked. Thirteenth century masons marks then to be angular lines often crossing lines. In Ireland by the fifteenth century masons marks had become very depicting masons marks had become very elaborate and many clearly show influence of older Irish traditions like the use of knotwork and interlace. Some are very fifteenth century Irish masons marks are very elaborate and its hard to tell if they are decoration or masons marks. South Tipperary has many fine examples of masons marks from this period for examples Holycross Abbey, Cahir Priory, Kilcooley Abbey and the parish church in Cahir and Molough Abbey. The Fethard masons marks consist of simple L shape incised design, a leaf, several knots, a hand, a floral motif and elaborate interlace designs. Many thanks to all who turned out for the walk it was lots of fun and I’m sorry I could not get a chance to chat with everyone. As always I learned from those present regarding traditions of modern masons and masons marks and examples of folk art in South Tipperary.